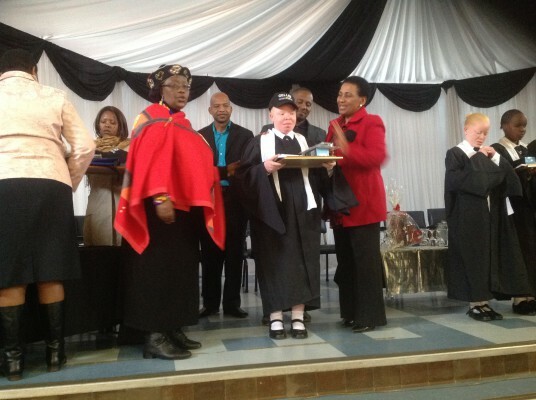 The Deputy Minister of Small Business Development, Elizabeth Thabethe (left), hands over a prize to a learner from the Arthur Blaxall School in Pietermaritzburg. With them are Michael Zonda (SEDA), Zibuko Mchunu (MD of iZibuko) and Nana Ditodi (Chairperson of Sawen). The Cell C Foundation supports the Techno Girl Entrepreneurship programme as an extension of the Cell C Take a Girl Child to Work Day initiative. Girls born into poverty will be given a much-needed techno boost, Mobile network provider Cell C has partnered with the Ministry of Women and the Department of Small Business Development (DSBD) to give hope to hundreds of disadvantaged girls and help lift them out of poverty. DSBD is committed to uplifting the living standards of those existing in these impoverished and disadvantaged communities while also equipping them to enter the mainstream economy. 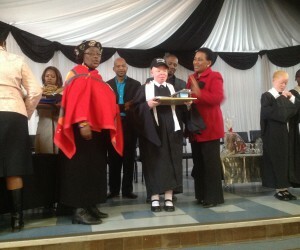 The Minister of Women in the Presidency, Susan Shabangu, and Deputy Minister of the Department of Small Business Development, Elizabeth Thabethe, enlisted the aid of the Cell C Foundation to support their initiative, Techno Girl, which is aimed at the educational needs and development of girl children. Cell C handed over 12 Smartphones with sim-cards and airtime, two tablets and a 4-in-1 printer to the Arthur Blaxall School in Pietermaritzburg. These will be given to the overall winning school which participated in the Technogirl Entrepreneurship Programme which was hosted by the Department of Small Business Development this year, a movement which has shown great promise. Since 2007 Cell C has been in partnership with the DTI’s Gender Unit in the Techno Girl Entrepreneurship Programme . This is a sub-programme of the Technology of Women in Business and an extension of the department’s participation in the Cell C Take a Girl Child to Work Day® campaign. The programme is targeted at Grade 10 to 12 girl learners from rural areas and aims to introduce them to entrepreneurship as an alternative employment opportunity. More than 100 girls from 10 rural high schools in a selected province take part in the project each year. To date a total of 90 rural schools and 900 girl learners from the North West, Gauteng, KwaZulu-Natal, Northern Cape, Eastern Cape, Limpopo, Mpumalanga and the Western Cape have participated. These girls are also afforded an opportunity to attend the annual Global Women’s Leadership Summit, which is held in a chosen city around the world, where learners are taught to engage with women and girl children from abroad and unpack the challenges women and girls face. Cell C applauds the active role in making Entrepreneurial Development Education available to the girls who participate in the campaign. Says Suzette van der Merwe, managing executive of the Cell C Foundation: “We also believe that the entrepreneurial development education programme that is in place ensures that the correct knowledge and skills are instilled and imparted in the learners to better enrich their lives and allow them to escalate their development and ‘know how’”.